I didn't realize Lisa of Sweetbeets (cutest letterpress cards!) owned two blogs! Side note, I met Lisa at this year's Stationery Show and she's super sweet as well! 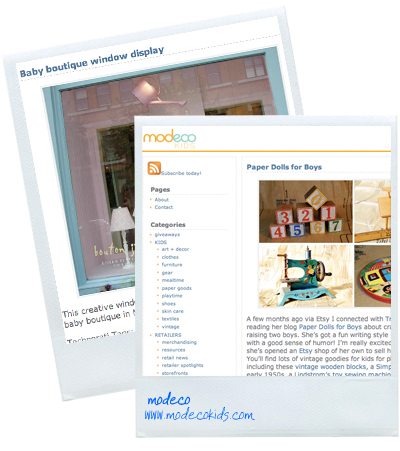 Modeco Kids, her second blog is full of modern and eco-friendly product ideas for babies and children. Great site Lisa! New blogs to check out, very cool! Lisa of Sweetbeets is the friendliest, most helpful person I have never met! I love her cards and have not been able to give a single one away. They are display only! She has been a great help with my new etsy shop (that's my shop she has featured there! ).